Khakhra is a thin cracker common in the Gujarati and Rajasthani cuisines of western India, especially among Jains. It is made from mat bean, wheat flour and oil. It is served usually during breakfast. Khakhras are individually hand-made and roasted to provide a crunchy and healthy snack that can be enjoyed with a selection of spicy pickles and sweet chutneys. There are variations in the method of preparation, but generally the following method is observed. Wheat flour (and/or refined flour), salt and masala are mixed. Oil, water or milk are added and kneaded to make a soft dough. This dough is then rolled into small balls and flattened. These are then roasted over slow heat and pressed via wooden press, until crisp and light brown in color. Here is the recipe of one such variation Methi Khakhra! In a bowl mix, whole wheat flour, kasoori methi, salt, turmeric powder & 1 tsp oil. Mix well. Using water knead into a soft dough. Cover & allow it to rest for 15 min. After 15 min, grease it with 3-4 drops oil & smoothen it. Make lemon size balls out of this dough. Meanwhile, heat tawa or pan on low heat. Now take a ball and using dry flour for dusting, roll it as thin as possible. 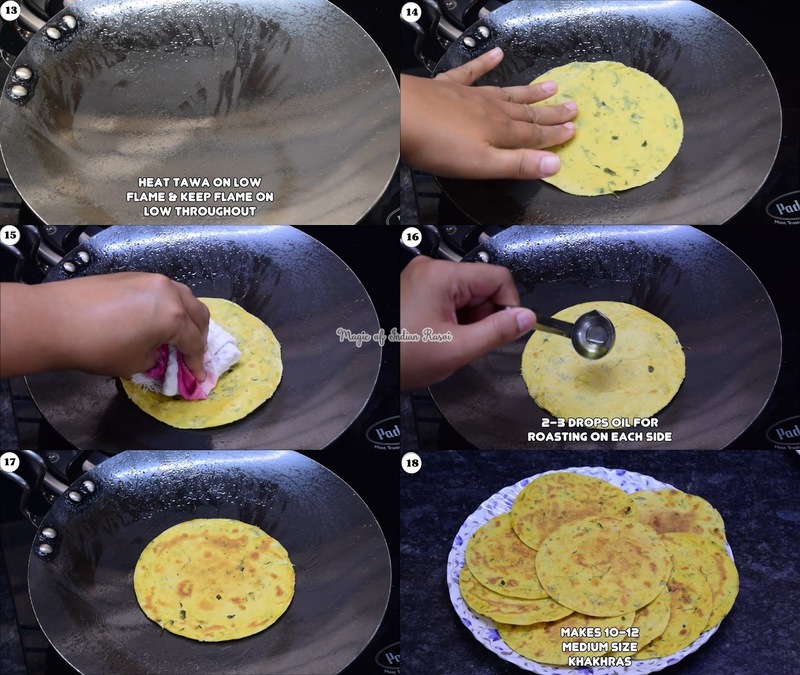 To make even size khakhras, use a plate or bowl with sharp edges to cut a round. Roast khakhra on low heat throughout on tawa. Keep pressing with wooden press or a clean cloth on sides and edges to make it crispy. Drizzle few drops of oil on each side and cook till crispy. 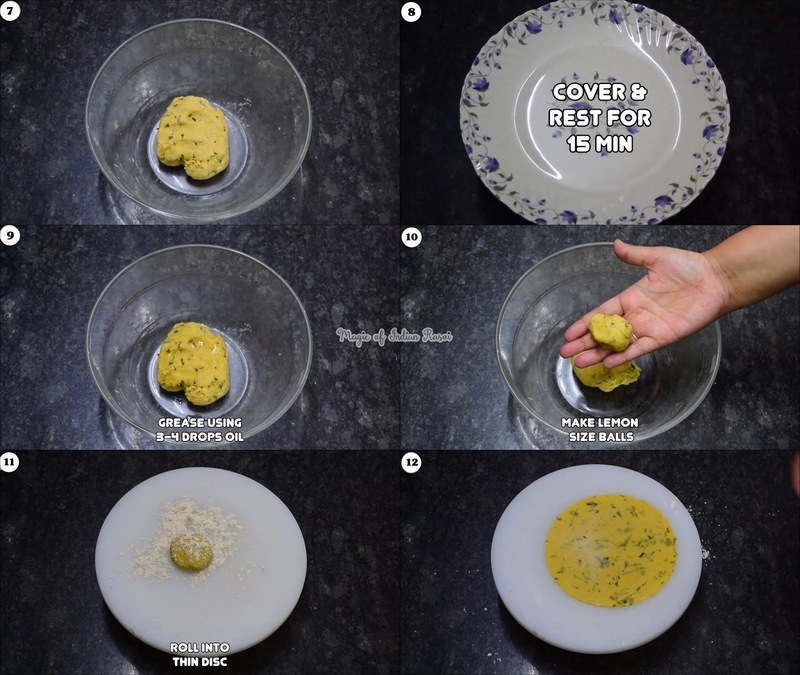 Remove on a plate and allow it to cool completely. 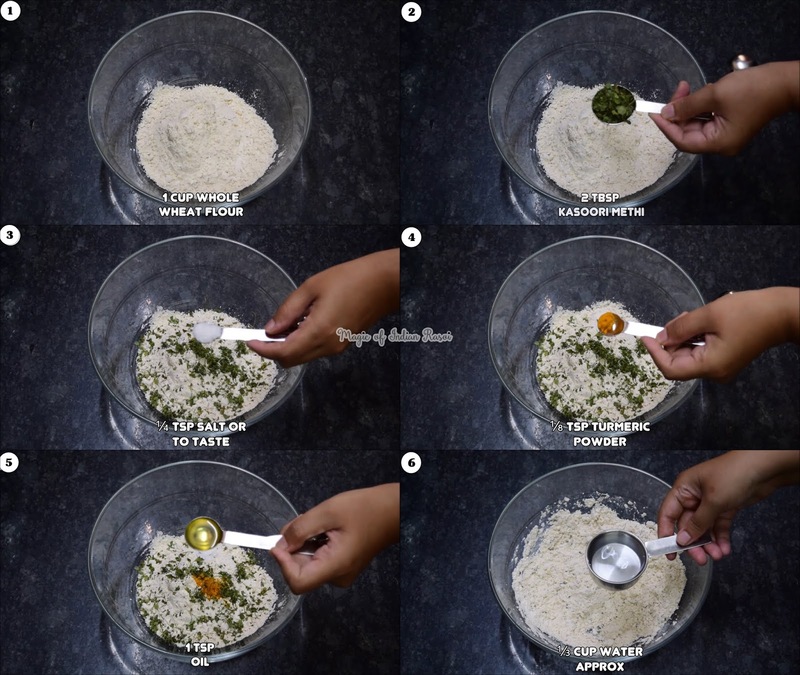 Prepare all the Methi Khakhra in the same way. Store in airtight container for 10-12 days! Healthy and delicious Methi Khakhra are ready to serve!